I get a great many comments about my website and how it reflects my approach to guiding executives successfully to their next C-level job. What seems to capture the imagination of my site visitors most is my reference to The Hidden Job Market. Although, the name The Hidden Job Market is deliberately intriguing, intended as an attention grabber, it is not a gimmick. It is a proven system. As the graphic shows, 80-90% of positions are never posted. Remember this when you or a loved one are floundering, wondering how to go about finding gainful and meaningful work. Indeed, the Hidden Job Market is very real. Any mystique surrounding the Hidden Job Market ends with its name. Having it work for you takes determination and work. But, these are not new notions to the people I meet professionally. They have earned their reputations and their C-level job of authority because they know how to develop and execute a plan. In this scenario, we examine the situation from a different vantage where the client sees him- or herself as a product going to market. I understand that navigating the job market is always stressful but when we roll up our sleeves and get down to it, most have reported back that they enjoyed the challenge immeasurably and found my process unlike anything they’d done before. That pleases me so much because I love to help. A misnomer I would like to clarify is that the Hidden Job Market is not code for networking – although networking is a vital component to success. Instead, the Hidden Job Market refers to all the jobs that are never posted, but that are available and waiting for someone of your calibre to fill. One little known fact in this market is that often – more often than you’d imagine – executive positions exist but only on a budget line. The organization wants and needs another senior member and yet the position remains empty for months. Why? How can this be? The answer is as simple as this: Time. Or lack of time, more the point. 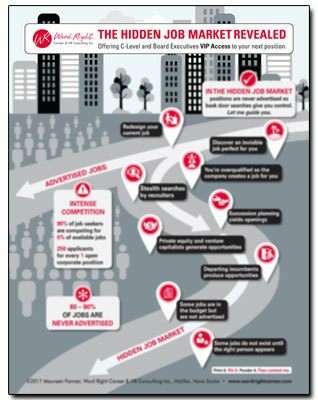 From there is the even more time consuming process of recruitment. No matter if you’ve been on one side or both, you appreciate the sheer number of hours and days and weeks it takes to find and secure the perfect candidate. And you also can appreciate that time is a precious commodity too often assigned to other tasks in the run of a busy corporate workday. The senior team can feel that they’re really only making do without their missing counterpart. What they really want is someone with all the qualifications to magically appear, someone who will make a smooth adjustment into their new position, someone who will assume the mantle and who will just get the job done. Suffice it to say that a plum C-level job may sit empty for some time BUT the Board, the CEO, the senior team, always have a budget for the right person. You’re that right person. The secret is knowing how to suss out a now-empty C-level Job that aligns with your skills. In addition, you need to know how to build a customized, career plan tailored exactly for those positions. This is work we’ll accomplish together, systematically. Approached strategically, you can be considered ideal for the job before it ever needs to be advertised. Yes, there is a glaring hole in an organizational chart out there, and there is a seat at the executive table that is perfect for you. In my upcoming blogs, I will explain more about other avenues we can explore in the Hidden Job Market. I’m Maureen Farmer, president of Word Right Executive Career Marketing and I am a 9-times credentialed career coach. I work with executives around the world. I get my clients market ready in 30 days and help them negotiate an average of 15.5% increase in total compensation. For a private 15-minute chat to discuss your personal business plan, click here: https://wordrightcareer.com/appointment-calendar/.